Al-Jaafari in Baghdad, September 2014. On June 14, Iraq’s Ministry of Foreign Affairs described the purpose of his visit: “he will, during the visit to China, address the world to side with Iraq in its legitimate war against IS [Islamic State]” (all sic). 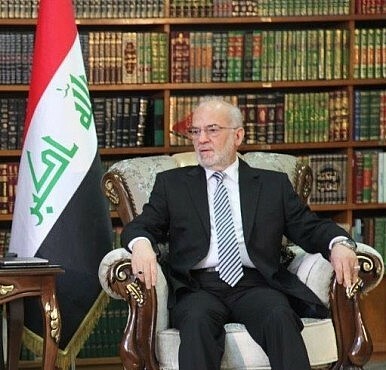 Jaafari noted that China has “expressed its readiness to support Iraq in its war against the terrorist Islamic State (IS) gangs without joining the international coalition,” referencing a conversation he had with Wang in September 2014. At that time, Jaafari said that Wang had offered China’s help in defeating IS, including providing support for air strikes – although Wang made it clear that China’s existing policies would not allow it to join the U.S.-led international coalition against IS. China has been coy about its commitment to the fight against IS, however, not willing to publicly commit to anything beyond personnel training for Iraqis. The official Chinese statement on the September meeting between Wang and Jaafari, for example, made no mention of increased Chinese commitment to fight IS. Instead, the statement noted Wang’s vague pledge that “as the friend of Iraq, China will continue to provide the Iraqi side with what it needs, including the emergency humanitarian assistance.” Despite repeated official pronouncements of concern over IS (including the possibility of Chinese fighters with the group coming back to China to conduct terrorist attacks), China has shown no inclination to provide military assistance to the Iraqi government. Under Rubaie’s formula, the sort of economic cooperation offered to Jaafari is exactly what Iraq needs from China – and at the very least it’s probably all Jaafari realistically expected.